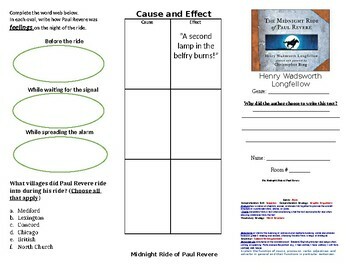 The "Midnight Ride of Paul Revere Tri-Fold" has comprehension questions for the narrative poem Midnight Ride of Paul Revere, by Henry Wadsworth Longfellow. The tri-fold is one page, doubled sided worksheet that folds to have three columns for three different grades. 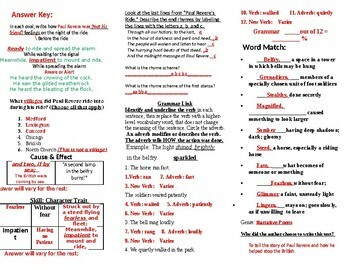 The grades include vocabulary from the poem and a grammar activity on verbs & adverbs. 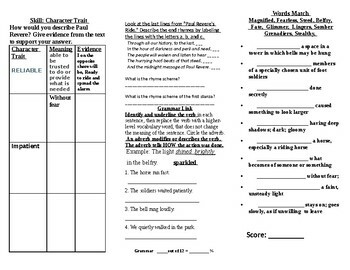 The last grade is for reading comprehension/skills and includes "Cause & Effect", "Character Traits" and "Poetry Rhyme Scheme" The answer key is included, but answer vary for certain questions.